Another transformation has taken place in Geraldine. Aorangi Vets has joined the growing list of local businesses sporting an edible garden. A row of Agapanthus was dug out and whisked away by keen gardeners, and equally keen passer-byes. A big thanks to Ash and Karen Pace and Bob Nelson for doing a lot of the 'grunt work'. Thanks also for the Pace boys for ensuring our new garden would be snail free! Next up to the plate were Lindsay Nelson, Dave Hendry and Sam Lees. 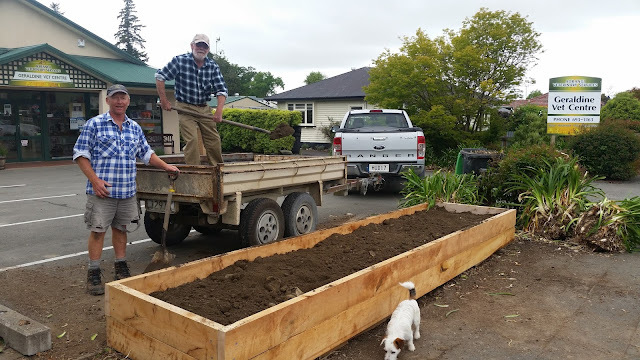 Within minutes this fabulous raised bed was constructed and filled with donated top soil. A huge thanks to these guys! The following day a generous layer of compost had been added, massive thanks to the team at Village Landscapes. 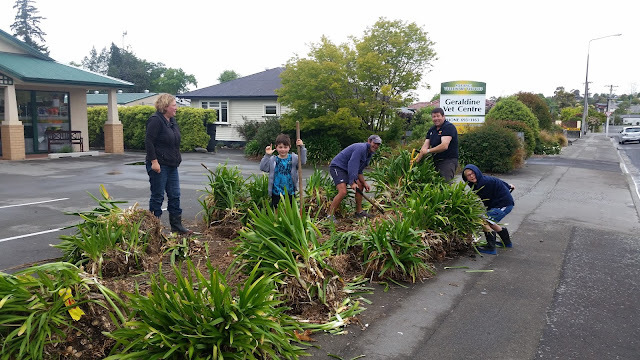 Thanks also to the green fingered students of Geraldine High for providing a great array of plants - Tomatoes, Herbs, Lettuces, Sunflowers, Swan plants(not edible of course but hopefully handy for some colourful caterpillars). A big thanks to the team at Aorangi Vets for looking after the new bed. We're all looking forward to enjoying some tasty veges! 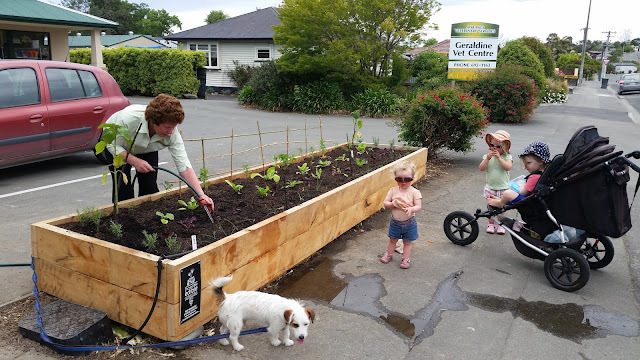 Located on Wilson street next to the Kindergarten, it's a great spot for children, and their parents, to enjoy the produce. Carol Seaton giving the new plants a good drink.